First of all, a happy 17th birthday to daughter Verena today, December 10. How could those 17 years have gone by so fast? I am glad to have Verena here at home during the day. It’s good to have someone to help me with cooking, cleaning, laundry, sewing, and all that goes with keeping a house going with a family of ten. Every one of the girls has helped me before getting a full-time job. This is a precious time to me: spending time with my daughters and making a lot of memories together that we will always treasure. It is also a great learning experience for them to learn how to do sewing, canning, baking and cooking. I helped my mother after I was out of school, and I remember how precious it was to work and talk together. Not only was she my mother but also my best friend. I want the same friendship with my children. My daily prayer is to be a good example to my children and to always guide them to live the life God wants. Since Verena’s special friend, Marvin, lives a couple hours away, we decided to surprise Verena on Sunday while he was here visiting in Michigan. Others who came in honor of Verena’s birthday were Timothy and Mose; Jacob, Emma and family; their daughters’ friends, Menno and Manuel; and also my sisters Verena and Susan. On the menu was barbequed chicken, hot wings and T-bone steaks, mashed potatoes, chicken gravy, dressing, corn, potato salad, lettuce salad, sliced cheese, homemade bread, butter, strawberry jam, peanut butter pies and a variety of Christmas candy. Verena had another surprise when Marvin presented a Dairy Queen ice cream cake to her with candles for her to blow out. 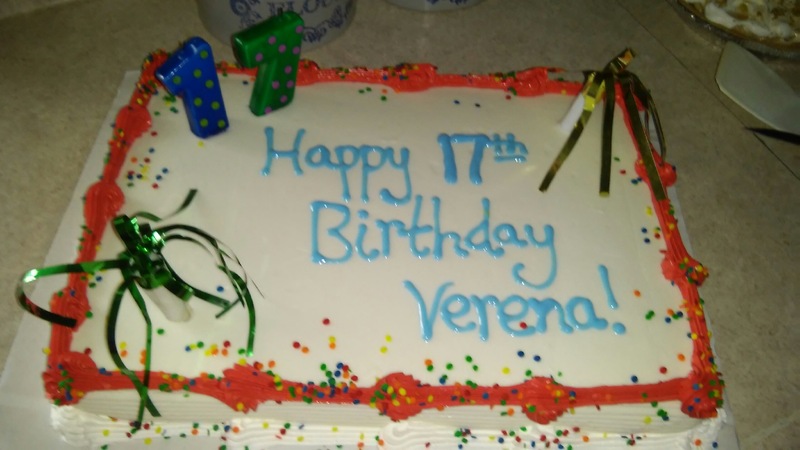 Lovina’s family celebrated daughter Verena’s 17th birthday with a surprise party. I forgot to mention that Barbara, a friend of our daughters, was also here for Verena’s birthday. She and Verena were born not too far apart, and Barbara’s mother and I both had the same midwife. Right after Verena was born at 6:32 a.m., someone came to our house to get the midwife, because Barbara was being born. Happy birthday wishes to Barbara! Christmas is only a couple weeks away. Joe and I did some shopping on Saturday. Verena is wrapping some of the gifts this afternoon. I don’t mind that job, but it seems I always have something else that needs to be done. I have a meeting at the school this afternoon. I would like to thank Carol from Washington for the four 1,000-piece puzzles she sent. We will have lots of fun putting them together this winter. And also a thank you to all the rest of you readers for your encouraging letters! 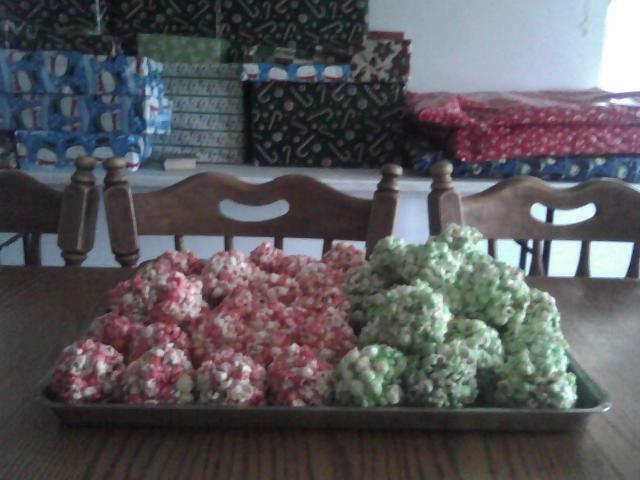 This week I’m going to share my recipe for popcorn balls. Mother made these every Christmas. She would put red food coloring in the syrup to give them a reddish color. I usually do half of them with red food coloring and half with green. It gives them a Christmas look during the holidays. Lovina shares her recipe for popcorn balls this week. Cook sugar, water, salt, and syrup to a very hard-ball stage (256 degrees). Add vinegar and vanilla (and food coloring if desired) to light crack stage (270 degrees). Pour slowly over popcorn. Mix well to coat every kernel. Press into balls and cool.